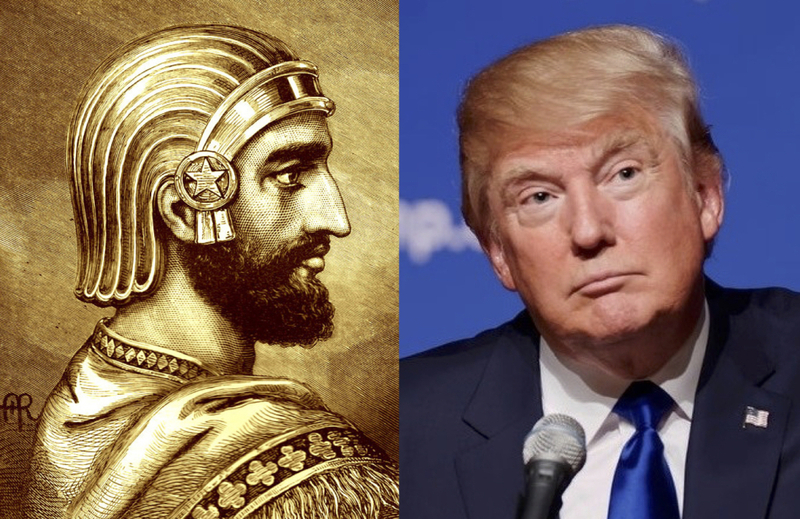 Earlier on in the Trump presidency I wrote a blog article titled: King Cyrus and President Trump. I picked up on the suggestion by certain Christians (typically those more enthusiastic for Trump) that the 45th US president was a Cyrus type figure, who is described as the Lord’s anointed in Isaiah 45. (Cyrus ruled the mighty Persian empire and Persia (Iran) today will play a big part in end time events). Concerning why Cyrus was welcomed, he proved to be a friend and protector of God’s covenant people – Israel. I have had time to reflect and while many have intense hatred for the man, including some of the otherwise goodies two shoes types I rub shoulders with, I have become more amendable to the idea that the Lord has indeed raised up Trump “for such a time as this”. I do so with caveats, as well as the obvious ones: I do not agree with all his political decisions and I cannot endorse all his behaviour. One being the Lord is sovereign and while it doesn’t always appear that way he is in control over all things, including who reigns in the nations. Another is whether good or bad we are called to pray for leaders and submit to them, unless it leads us to compromise our faith. Yet another is the Bible, which has many examples of leaders anointed by God. Think Saul and David who Samuel the prophet anointed and the kings of Israel and Syria who Elijah anointed. I got thinking about the subject when I read one Christian leader with a large following of (I assume) Christians having his customary pop at Evangelicals who support Trump. He accused them of doing so in order to gain power. I felt this was disingenuous and not applicable to those who I know personally. Trump like all presidents is a flawed human being and given the type of character he is those flaws are even more evident. Revelations arising from his spat with his former strategist, Steve Bannon, and along with that the recently published book by Michael Wolff, pointing to insanity in the White House, and his childish N.Korea tweets are the latest in a long line of examples of his flawed character. It is not for me to excuse Trump, who is decidedly not my “cup of tea” personality wise. As for supporting him, I care little for Trump the man (although I do see a welcomed drawing toward God) except he is the Lord’s anointed, but I do care about the world view he represents and Trump comes closest compared to the alternatives to having the right one, and is adept at acting in a consistent way regarding policy implementation. As I have often argued – we are in a culture war (I have written an entire e-book covering the subject). The broadly Judaeo-Christian consensus that once existed is being subtly and steadily replaced by something far more insidious and because this Evangelical obeys the two great commands, I can’t stand the thought of this disastrous move in the wrong direction going unchecked and feel compelled to resist. I believe America is ripe for judgment but God is giving America one last chance to change its ways and in his mercy he has given them (and us) Trump, for reasons contained on my “Donald J Trump – bad, mad or good?” e-book. Yet always we must NOT trust in flawed man; but rather trust in Almighty God, and as the hymn writer wrote: “the Lord works in mysterious ways“! While Trump may be an unwitting Lord’s servant, he is one nevertheless. Update 29/01/18: I have in mind to preach a sermon on Cyrus, WITHOUT mentioning Trump and will do so. I find the biblical account fascinating as well as encouraging. Reading the Isaiah 44/45 account there is little doubt Cyrus was NOT perfect and when God called him he didn’t even know God, but God blessed him, removed obstacles in the way and enabled him to be Israel’s deliverer. Cyrus was an enlightened king, with his acts detailed (200 years later) in 2Chronicles 36 and the early chapters of Ezra, and in non-biblical accounts. The reason why the story is important is it illustrates how God is indeed in control and can use unlikely people to carry out his purposes. Even if Hillary had won, I would still needed to pray for her and accept God’s sovereignty, realising there are very few world leaders I would choose if I had the power to do so. But she didn’t and instead it was Trump – a modern day Cyrus. On the eve of Trump’s first State of the Union address and with the release of the memo pointing to FBI corruption, I predict further confirmation that Trump has been raised by God for such a time as this. God acts both in judgment and mercy and it is for Him alone to decide which. I hope and pray that the people will rightly respond. → Blair, LaMonte, and a second Brexit referendum? I look at the man in the same way. Thank you pastor John Barber! Not that mysterious.” Know them by their fruits” You write, “Revelations arising from his spat with his former strategist, Steve Bannon, and along with that the recently published book by Michael Wolff, pointing to insanity in the White House, and his childish N.Korea tweets are the latest in a long line of examples of his flawed character.” I do not see and Love for others, only for him self. A very stupid and dangerous man.